This is the women’s specific version, this pack is also available as the men’s Optic, and both are available with a 55-liter capacity. Each year, more brands are catching on as long-distance hikers opt for slimmed-down packs. Gregory has been known for ultra-padded, heavily featured packs, and the Octal / Optic are part of their new lightweight line. 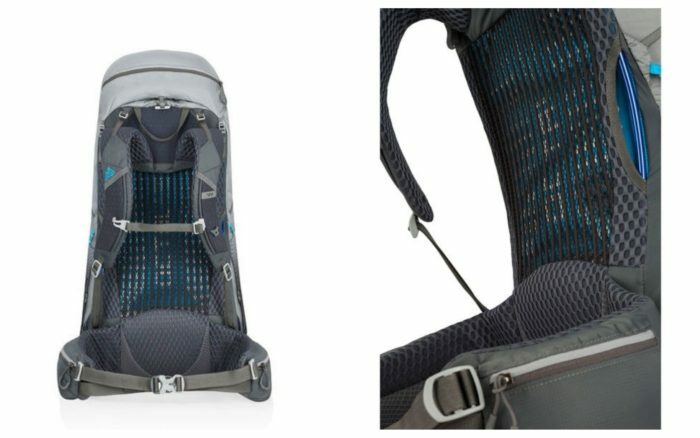 At 2.5 pounds, this pack follows in the footsteps of hiker favorites like Osprey’s Exos, finding a middle ground between the minimal weight of a UL pack and the comfort / convenience of more feature-heavy packs. With lightweight materials, smart design, and a streamlined system, this pack manages to feel lightweight while distributing weight in a comfortable, effective way. Despite the low weight, this pack is still comfortably padded and stacked with features like an aluminum frame, five external pockets, a dual-pocket removable brain, and a hydration bladder pocket. Backpacking around Montana, Wyoming, and Utah with a base weight of 11 pounds, plus 3-4 days of food and 1-2 liters of water. Organization is easy with the front mesh pocket and removable brain with two pockets—top and bottom. The two deep side pockets hold water bottles securely… somehow still a novelty in most pack. The hip-belt pockets are a decent size, but could be a little bigger. The pack comes with an internal hydration reservoir pocket in case you decide to go the hose route. Suspension system and load distribution includes a comfortably padded hipbelt, an adjustable chest strap, padded shoulder straps, and load lifters. All of the straps, buckles, and placements are highly adjustable and easy to shift around on the go based on terrain, load, and comfort. Gregory’s AeroSpan suspension system (pictured below) is held in place with a sturdy-yet-lightweight aluminum frame. The pack opens from the top and secures with a drawstring closure. If you choose to remove the brain, the pack comes with a separate “flap” that buckles over the top of the pack for protection. The pack also includes a separate fitted rain cover and a “quick-stow” feature for sunglasses. This is an incredibly well-fitting, comfortable pack. The suspension system and ventilated back panel allow airflow between your back and the pack, while maintaining a secure fit and preventing lower-back strain. Load transfer is seamless, and the adjustments are seemingly infinite. The pack stayed tightly on my hips and against my back without feeling constricting. The women’s-specific shoulder straps never rubbed or felt like they were in the wrong place. If you come from one of Gregory’s more padded packs, this one might take some getting used to, but it’s right in line with other lightweight packs, straddling the line between comfort and ounce-saving. Very well designed. The side pockets are deep enough for a large SmartWater bottle, and feel secure even when putting the pack down repeatedly. I use the front pocket for an extra layer, or for stuffing things into when I’m too lazy to open the pack. It’s stretchy but durable, and plenty big. I usually leave the brain on for hiking—the dual pockets are super convenient for organizing small items, and the zippers are a good size and easy to maneuver. The hip-belt pockets are a decent size, could be a little longer as many hikers like to stash their phones in their hip pocket for headphones or camera access. For adjusting on the go, the webbing system is intuitive and smooth on all points—shoulder straps, hip-belt, load lifters, and chest strap. Terrific balance between weight and comfort. 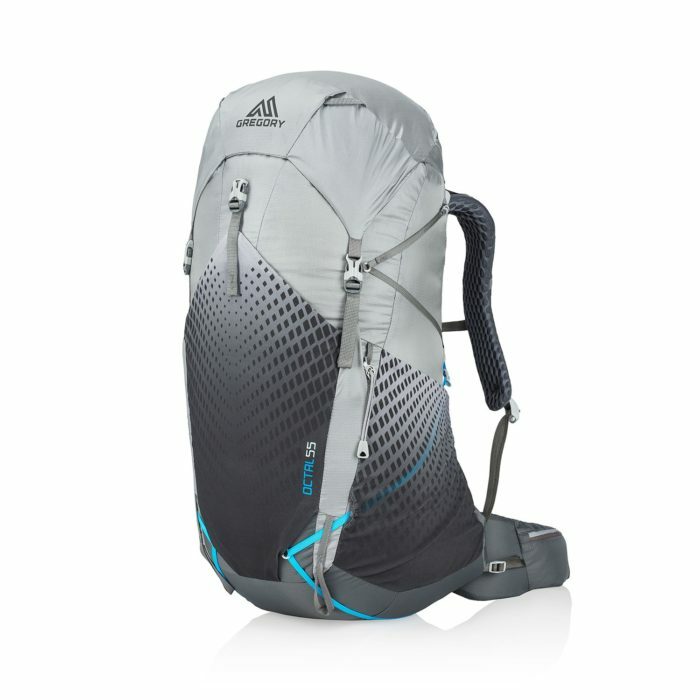 The weight distribution is a dream, as it is with all other Gregory packs I’ve worn. Gear organization is easy thanks to multiple external pockets for organizing, and the suspension system seems to float over your back. I would love to see pockets on the shoulder straps… I’ve gotten used to carrying my phone (and sour gummy worms) for easy access. If the hip pockets were a little longer, it would be easier to slide a phone into for easy photo access. Gregory has done a terrific job with their venture into a lighter model. 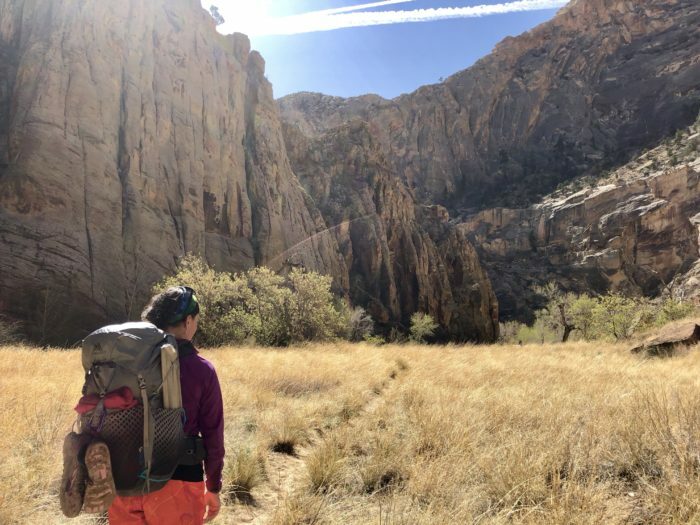 By maintaining a balance between weight and comfort, this pack gives the best of both worlds and is a really good option for hikers looking to get a more streamlined pack, but not ready for a UL frameless. 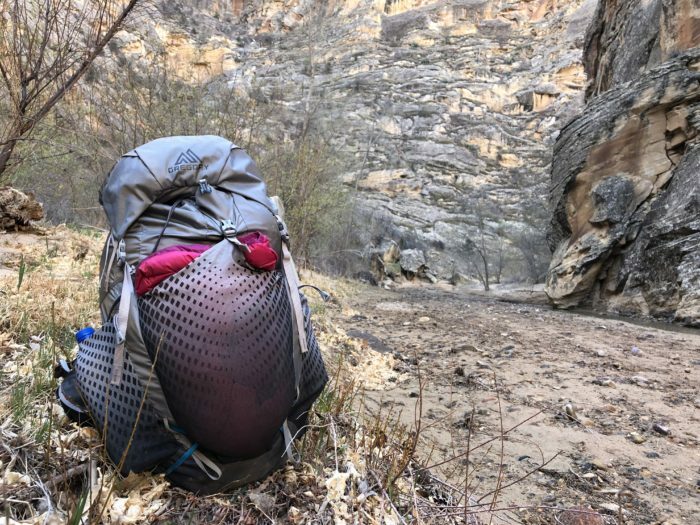 This pack comfortably carried 25 pounds, and even though a 45-liter capacity is smaller than I’ve used before, I never felt like I was overstuffing the pack in any way.